Let’s pretend. So much of how I entertained myself as a little girl had to do with pretending. I was never fast enough or strong enough or athletic enough or, um, lean enough to join in all the (reindeer games) physical activity (undoubtedly super fun I know I know) that went on with other kids my age. Instead I was mostly with my dolls or playing dress up or reading books or generally having a ball with that pre-PlayStation thing called “my imagination”. My imagination was my savior on many rainy afternoons. It saw me through my bouts “in the corner” when I was naughty. It made mine and my brother’s Barbie and Transformers games possible. It made long car rides bearable. It made me believe I could be Scarlett O’Hara. No small feat that. All that for the bargain price of absolutely free! To this day it’s still with me. I nurture and pamper it. Feeding it richly and indulging its many whims. Wild dreams and imaginings still see me through many of life’s events. Not the least being long queues at the bank and waiting in airports – oh how it helps in those situations! But also during times of anxiety and stress that often come with this territory called (phooey) adulthood. Some may think it childish escapism, these games of “let’s pretend”. I like to think of it as “creative solutions”. Like now for example. Like let’s pretend I’ve never posted a banana bread recipe on this blog before. – Melt the chocolate in a double boiler or in a bowl set over a pan of simmering water, taking care not to let the water touch the bowl. Set aside. – Cream the butter and sugar until fluffy and pale. Gradually add the eggs, one at a time, beating well between each addition. – Sift the flour, baking powder, and cocoa powder and fold into the wet ingredients (I like to use a flattish metal spoon for this). – Add mashed bananas and melted chocolate and fold in well. – Place in a greased and lined loaf pan and bake in a pre-heated 180C oven for 50-60 minutes or until a wooden toothpick inserted in the middle comes out clean. Cool on a rack, then wrap in baking paper or foil. Oh, sweetie, that is more than OK – the more recipes with banana, the better! Wow, it looks so scrumptious! Very chocolaty indeed! Looks crazy good. I guess saying it looks buh-nanas would be appropriate, no? Can't wait to try this!!! No need to pretend, Joey. One can never have enough of banana bread. Chocolate… yum! Hi Patricia! I can never have enough banana bread! These were really rich…yummy! Hi Peachkins! Yup! And these are you the ones I’ve posted! There is more banana bread where this came from, oh yes indeed! Hi French! Quite appropriate 😉 Hope you like it too! Hi Anh! I agree 🙂 And especially with chocolate! Gawd that looks so good. And to think I don't like banana bread. Might make an exception for this though. This recipe brings together three of my favorite things: bananas, chocolate, and muscovado sugar! I've never made banana bread, so I I'm bookmarking this try soon. I made banana cake recently. this looks rich! rich and good! 😉 yum! Hi Midge! You favorite things make a great combination 🙂 Will let you know if we can make it! Hi Liska! Thanks! Glad you liked it! I checked out your post on this cake and your photos are gorgeous! I wish I could read your delectable looking posts! Hi Paz! It was indeed rich…and yummy! Man! this looks sooo amazing. Every time I come to your blog, I'm reminded that the dense chocolate Nigella cake is still pending on my to-bake list! Sig. And now I've just added another one. I love how banana bread is always soo moist and this looks so perfect. Yum Yum Yum! Chocolate and bananas are wonderful together. I've made chocolate banana bread before, in the Moomin loaf tins, heehee, but with some brown bananas in the fridge now, it's time to make some more! I can't wait to try this recipe!!! Hi Purple Foodie! That dense chocolate cake by Nigella is really a winner in my book 🙂 Love how bananas keep cakes moist too! Hi Iyor! I like to stuff brown bananas in the freezer (peeled but whole in a ziplock bag) so I have them on hand whenever I want to whip up some banana bread 🙂 I must use the Moomin tin next time!! Hi Mikostinko! Hope you like it! Hi Katiez! 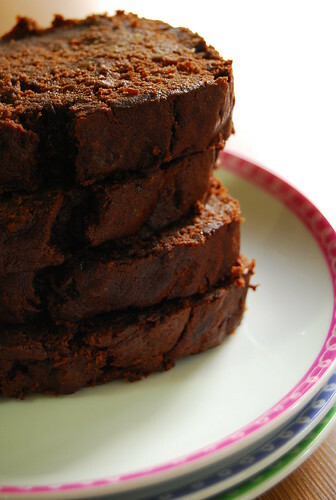 Chocolate zucchini cake is something I have been wanting to try too! I am the same way with scary movies!! wow.. choco + banana bread = yummy!! Banana Bread and chocolate wow! Wanna be my personal chef? LOL! These looks fantastic, I'll have to try the recipe sooner rather than later! Hi Maria! Hope you like it! What is that? Any substitutes? thanks for the recipe. this will be my bonding activity with my only daughter this weekend!